WATCH: A measles scare continues in Vancouver with new cases being reported in at least two local schools. Neetu Garcha reports. Vancouver Coastal Health (VCH) has confirmed a measles outbreak with at least eight cases involving school-age children. The outbreak comes as some health experts say the number of kids getting vaccinated has fallen to surprisingly low levels. Data from Vancouver Coastal Health show that measles immunization rates of kindergarten students at Metro Vancouver schools fall short of that mark. According to VCH data, the vaccination rate for measles across all kindergarten students in the VCH region is just 83.1 per cent. In 2013-14, the kindergarten vaccination rate was 88.4 per cent. Of the 127 schools in the City of Vancouver, only 27 have kindergarten measles immunization rates of 90 per cent or higher. The VCH numbers appear to confirm data from a 2016 University of British Columbia study that showed some of the lowest rates were found in the region’s more affluent areas such as North Vancouver and West Vancouver. According to VCH, just two of 17 schools in the area of West Vancouver-Bowen Island had kindergarten measles vaccination rates above recommended levels. Mulgrave, a private school, had a kindergarten measles immunization rate of 66.1 per cent while Caulfeild Elementary had a rate of 80.8 per cent. Just four of 29 elementary schools on Vancouver’s west side were above the 90 per cent threshold. Immunization rates of 90 per cent or above are needed to achieve “herd immunity” within a community or school to protect those who are – for various reasons – unable to get vaccinated themselves. In lower-income areas, a lack of access to health care can contribute to low immunization rates, he said, while wealthier areas face a different challenge. “We do know that vaccination activism is certainly quite higher among more affluent communities,” said Carpiano, who is now a professor of public policy and sociology at the University of California, Riverside. WATCH: (Aired Feb. 17, 2015) Should vaccinations be compulsory? Carpiano commends VCH for making vaccination data publicly available, saying it can help parents learn about vaccination rates in their community. While public health often focuses on big-picture statistics — such as national or provincial cancer rates — he says when it comes to immunization, drilling down to find data on schools and neighbourhoods matters. “Looking at these school numbers, these are the kids that somebody’s child is going to be interacting with every day,” he said. “And that’s how these diseases can be spread. They really are local level health issues. 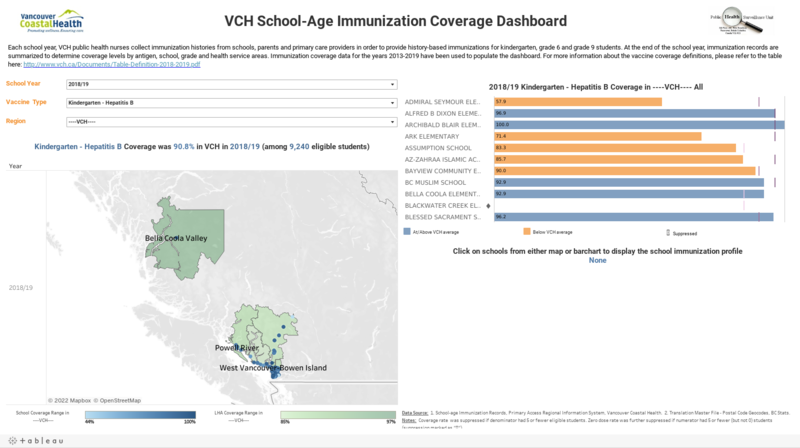 Vancouver Coastal Health’s school-age immunization coverage dashboard can be found here.